ATATÜRK SMILES: 1999 Ataturk Gulumsuyor! - Ataturk Smiles! 1999 Ataturk Gulumsuyor! - Ataturk Smiles! 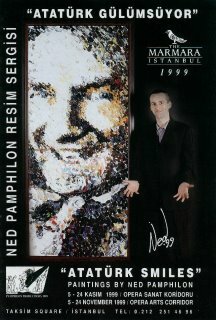 The Marmara invited NPP to exhibit portraits of Ataturk to coincide with 10 November, the anniversary of Ataturk’s death (1881–1938). 12 portraits were displayed depicting an age range from Young Turk to mature statesman. Ataturk’s image symbolises a vision of the secular system, national unity, education, art, science and liberty for both man and womankind alike; a global vision embracing new ideas and innovations for the betterment of his people and country. Ataturk was very aware of his public profile and veered toward a serious image portraying his serious intentions. Occasionally though, he did and we can, enjoy a smile.